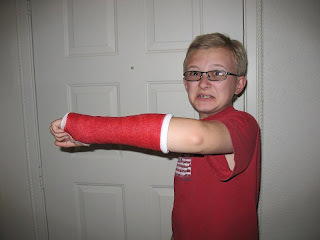 ~ My son started out the week by breaking (technically just fracturing) his arm! Argh! Poor kid - was very painful. He fell while trying to play tennis with his dad. So sad because he's excited about tennis and we hit a sale that very morning to get tennis rackets and balls and new tennis shoes for him ('cause his were way too small and worn out). He and my hubs went out and found an empty tennis court nearby and started to play. But kiddo got tripped up and fell, fracturing his left arm. Anyway, he's back at school to finish out the last week and has his cool new cast on! This is what happens when you say smile and he does...until you hit the button and he makes a face. After the ER visit, *suffering* by propping arm on pillows to play video games! ~ This is the last week of school - Woo Hoo! I'm working on homemade teachers' gifts and goodies today. Tomorrow is a last meetup with Bible Study ladies and my last time for the year of volunteering at the school. Then Friday is school awards assembly and I'm helping drive kids to the end-of-year rollerskating party (and son can't skate now - boo!). Then on to Junior/Senior High graduation - our son isn't graduating, but we always attend because it's such a special event at our small Christian school with inspiring speeches. I believe there are 11 8th grade graduates and 6 Seniors graduating. ~ I've fallen off the wagon this week for the 31 Days to Clean challenge! I'll get back into it starting next week, our unofficial beginning of Summer! What's going on with you this week? Have you started Summer break yet? Have a fabulous week friends - I'll see you next week! After school is done I am going to talk to Jeri and we will all get together. I'm glad to say that our week was a little less eventful. Well at least the half that's past already. There are still 3 more days yet so there's time. LOL! We actually had a great weekend. Very fun. 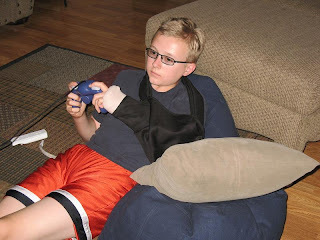 Big you can't keep a good boy down and he'll play his game with a fractured arm to prove it size hugs to you! How are you enjoying the 31 Days of Clean?